My pal for the Crochetville Spring Secret Pals was Chelle. Previously, she sent me this and this, and yesterday I received a fantastic reveal package from her. Thank you, Chelle, this is an awesome package! 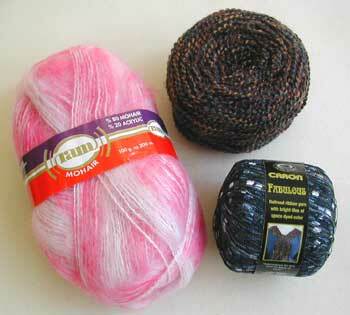 I love to pamper my feet and try new yarns, and I am a glass bead fiend! A massaging foot scrubber with soft bristles on the top and suction cups on the bottom for use in the shower, a 4-in-1 pedicure paddle (brush, pumice, metal file, and smooth file), Udderly Smooth Foot Cream, and Wet’n'Wild nail color. YarnArt RAM Mohair (pink variegated), a homespun type yarn (intertwined teal, navy, tan, and maroon), and Caron Fabulous (in blue, called Mediterranean). 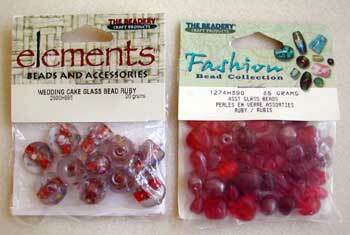 Two packets of ruby-colored glass beads.